Windows messaging system is very useful for doing asynchronous programming, including multithreading. But what about performance? In asynchronous operation, including multithreading, a developer frequently needs a message queue to serialize processing and notifications. Windows has his own message queue which is mostly used for the user interface but also for many asynchronous tasks such as sockets notifications. In multithreading programming Windows own messaging system is very handy because it solve a big issue: synchronizing threads. When a thread post a message to another thread message queue, that message will be processed in the context of the thread which owns the message queue. This is also true when the message is sent instead of posted. What is the difference between PostMessage and SendMessage? Easy question: PostMessage add a message at the end of the recipient queue and returns immediately. SendMessage do the same, but wait until the message is processed, switching thread context if required. Ok, now what about performance? To evaluate it, I wrote a small test program. It makes use of a so called “worker thread” to process messages. The main thread will send message to the worker thread message queue and measure how long it takes. The worker thread will remove and process the messages from the queue and also measure how long it takes. - 32 bit: 0.7 micro second to post a message and 0.9 micro second to retrieve one message. - 64 bit: 0.6 micro second to post a message and 0.7 micro second to retrieve one message. I wrote “on average” because the time varies a lot depending on the system activity. The test program post 5000 messages as fast as possible while the worker thread is blocked and then the worker thread retrieve the messages. A high resolution timer is used to measure the times. My demo code is interesting beyond the subject of this article. I build a reusable worker thread class having a message queue and a message loop. Then in the main program I derived a new thread class from the worker thread class and added to code specific to this application. The worker thread class (TMsgHandlingWorkerThread) has an Execute procedure which creates the message queue, call a message loop and then destroy the message queue before terminating. This behavior is exactly the behavior of any GUI application. Delphi runtime does all the work required in his forms unit that is why you never see it. Creating a message queue is basic Windows programming. It has been the same since almost the beginning. It is a matter of a few native API calls and involves creating a hidden window so that the message queue has a handle. Windows native API is not object oriented. 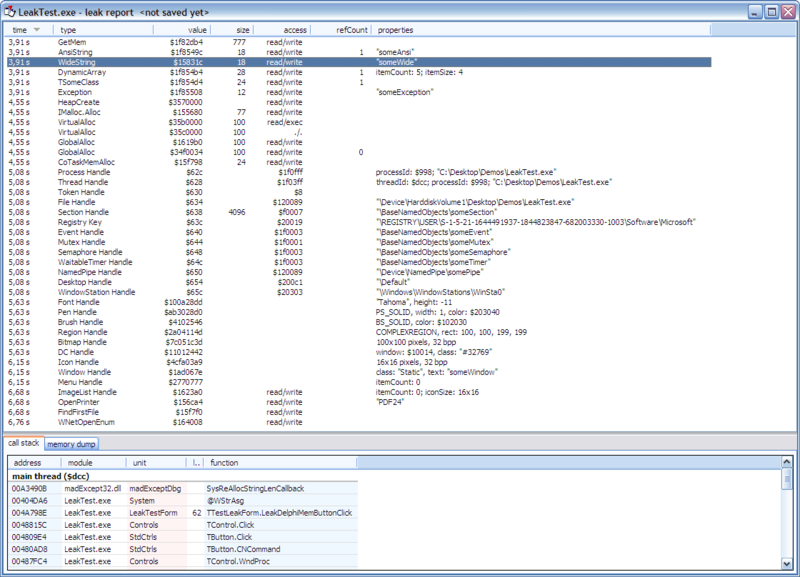 So I have added some data to bridge between Windows API and Delphi object model. I simply added a pointer to the class owning the message queue (Our worker thread) to the data Windows is storing along with each window. Later, when Windows calls the procedure to handle the messages, that pointer is retrieved and used to call the object’s WndProc. This probably sound complicated if this is the first time you see that kind of code. You’ll find tons of articles explaining this basic Windows programming. This reminds me a very old and excellent book by Charles Petzold: “Programming Windows 3.1” published back in 1992. He reviewed his books several times since then. Almost everything in that book is still applicable for 32 and 64 bit Windows! One other interesting point in the demo code is the use of Windows “event” object. Do not confuse this with the events you use every day with Delphi. Beside the names, they have not much in common. A Windows event is an operating system synchronization object. An event has two states: signaled and nonsignaled. One can programmatically set it in the signaled state or wait until it is in signaled state. Here in my code I use two Windows events. One to block the worker thread while the main thread fills the message queue with thousands of messages and another one the main thread wait for his signaled state while the worker thread is processing the messages. The events are created unnamed and in the nonsignaled state. WaitForSingleObject API function is used to block until the event goes in signaled state. A thread which has called WaitForSingleObject is put to sleep until the event becomes signaled. By the way, if several threads are waiting for the same event, one and only one is unblocked when the event is signaled. Another Windows operating system synchronization object is used by my worker thread class. It is a critical section. A critical section is an object that can be “entered” or “leaved” by a thread. Only one thread can enter the critical section. No other can enter it until the first one has leaved. Trying to enter a critical section already entered put the thread in a wait state until the critical section is leaved. My use of the critical section is to make sure only one thread is able to register or unregister the window class used to create the hidden window. It is also used to make sure the handle is accessed only before or after it has been created but not in the middle of his creation. There is an API “NameThreadForDebugging” to give each thread a name. Actually this doesn’t really give the name to the thread but associates a name with a thread for the debugger. If there is no debugger, it just does nothing. When you use this thread naming, you can see it in action with Delphi debugger. One on a breakpoint, show the thread windows (Ctrl + Alt + T within the IDE) and see the thread name appearing in the thread list. Very handy for understanding what’s happen whith your threads. Description:  Demo code for worker thread having a message pump. // worker thread will start waiting. // Spin while waiting for handle to be created. ToDo: timeout! worker threads: all methods are virtual. // class is registered and register it if needed. // thread which just destroyed a previous window. // Not registered yet, do it right now ! // handle messages sent to the window. // Unregister the window class use by the component. // The loop is broken when WM_QUIT is retrieved. // the message loop is broken. Using FastMM is very easy. There is no install, just copy the files somewhere on your hard disk. You have to add FastMM4 unit as the first unit under the "uses" section in your project's dpr file. Then you recompile the application. To take fully advantage of FastMM feature, you should open FastMM4Options.inc file and change some conditional compilation directive. This file is heavily commented to explain all the symbols. When developing your application, you should define the symbols "EnableMemoryLeakReporting" and "FullDebugMode". Defining FullDebugMode symbol cause code doing extensive checking of all memory blocks to be included in the application. All blocks are padded with both a header and trailer that are used to verify the integrity of the heap. Freed blocks are also cleared to ensure that they cannot be reused after being freed. This option slows down memory operations dramatically and should only be used to debug an application that is overwriting memory or reusing freed pointers. Setting this option automatically enables CheckHeapForCorruption and disables ASMVersion. Very important: If you enable this option your application will require the FastMM_FullDebugMode.dll library. madExcept is a tool created by Mathias Rauen. It is an incredibly useful tool, not only for memory leaks, but to help finding the cause of all kind of exceptions. madExcept is one of the tools in madCollection. It is worth looking for all. To use madExcept, you have to install it because it include a "wizard" which is show in the IDE project menu. This wizard will configure the tool and add the required units to your project. The first page of the wizard has most interesting options, notably the one to select for reporting the leaks (memory or other resources).